These defended settlements take a variety of forms, but all have defensive ramparts and ditches. They date from the last centuries BC and the 1st century AD. 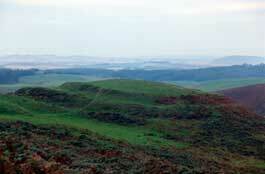 Some hillfort ramparts were originally stone built, and some of these were laced with timber. If the timber was burnt, either deliberately by occupants or by enemies, bits of the stonework became fused together or 'vitrified'. In other hillforts the ramparts were of earth only. Within the defences there were circular timber buildings. Small stone forts in the west are known as 'duns', and may have been roofed over. The largest forts, such as Traprain Law and Eildon Hill North, were tribal capitals.